The cover of the 1934 Season Hagenbeck-Wallace program with its painting of Beatty 'facing Hagenbeck-Wallace jungle killer "Sammy"' is one of my favorite bits of H-W artwork, though the advert inside with "giraffe necked women" selling Pontiacs is pretty special too. That's a beautiful picture. I love the intensity brought by Beaty to the circus. Beatty, was a fraud. He had no animal trainning ability at all. He's extent of animal trainning was don't got into the lion cage with no shoes on or you might step in cat poop. Beatty was a great business men and new how to mingle with the executives. But as far as animal trainning he was worthless. Look how he struggles in the cat cage to command authority. Even the pictures show his lack of style and grace. Who remembers the Ed Sullivan Show where Beattys cats got into a fight. they had to pull the curtain and Ed went into the seats while the real trainer stepped in and settled the Cat. Maybe Rodger has some memories to share. Its not like we did not like Beatty, its just that he was no trainer. Just like one of the most heard of sanctuary persons. Never did anything but show up to have her picture taken. Hey What ever works for you. Just don't try to fool real people who know you. You are accurate Ben Trumble but I a sick of speaking with friends and hearing people say "Beatty was amazing with animals and fabulous trainer." I sometimes hear, "that trainer is not nearly as good as Beatty was." 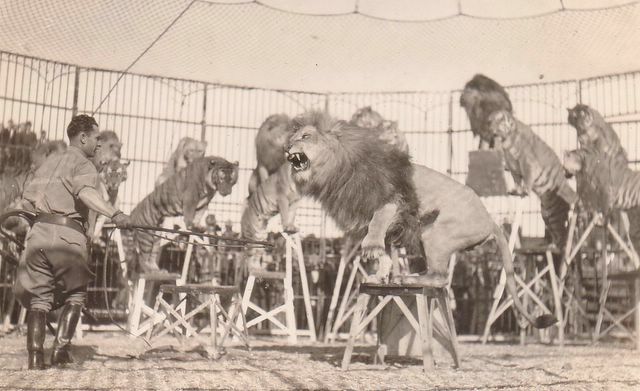 Clyde Beatty was not an animal trainer. He didn't spend the hours training animals feeding the animals, and bonding with the animals. He spent his time with the big wigs and pretending to be that world class trainer that Barnum had and everyone else wanted. But Beatty could not train animals. I wouldn't leave him in room alone with my pet cat. Secondly, let's get your facts straight about the Mercury missions. The Mercury missions were mostly unmanned flights. There was 21 total Mercury missions and 14 were unammaned. The most significant Mercury mission was the Faith 7 that Gordon Copper was weightless for 34 hours. If you want to compare Flying space to training animals then Beatty was the Astronaut that looked pretty in the space suite. An the animals trainers were the Engineers, Houston command center, and all the mathematicans/scientists that did all the ground breaking work. Beatty was a sell out and "hollywood" so yes he was a fraud. The headline should read "Clyde Beatty faking it again"
Keep posting Buckles I love the web blog. Ted, we probably agree regarding Beatty's abilities (or lack there of)100%. It is strickly as an entertainer taht I tip my hat to his long career. And as Buckles noted, he excelled as selling a positive image for "circus" as an enterprise. He was a very successful "fake" in business that's had some wonderful fakery now and then. When I think of fraud I think more of grift. Because he was a good fake, a generation of audiences rarely felt defrauded. You're spot on in feeling annoyed when anybody suggests that a real trainer "doesn't have the way with animals that Beatty had." Roger. Thanks for clarifying, and setting the record straight. There's no better source than the guy who was there! Nothing to do with training, but wanted to write how lions still help me today. I own a Grooming Shop. Other shops give Chow Chow dogs a lion cut. They just shave the poor animal down and leave hair on his head. The picture of this lion is how I do it. You would be surprised the new clients I get. My Chow Chow ( HUNG CHOW) looks very much like a real male lion. Makes me proud. My lions on Fairyland were females, so no manes.